This clutch is best surprise for women you caring about, for your girls, lover, honey, dear, sweetheart, girlfriend, family, friends as a Birthday, Valentine's Day, Anniversaries, Mother's Day, Thanksgiving, Christmas, Graduation Gift,etc. Clutch Wristlet - After removing the shoulder strap, it is a wristlet. 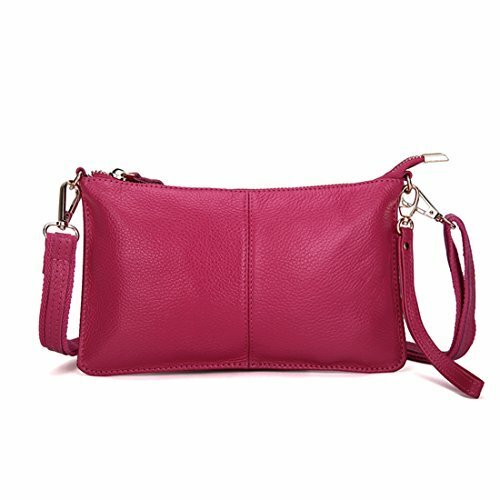 Cross body bag - After removing the wristlet strap, it is a crossbody bag. Small Shoulder Purse - After shortening the shoulder strap, it is a shoulder purse. ❤DIMENSIONS - 9.4 * 0.4 * 5.9 inchs (L*W*H) Wrist strap: 7.5" Longest Shoulder strap: 45". Weight:0.45Lb. ❤HIGH QUALITY - This handbag is made of high quality genuine leather with fabric lining, soft hand feeling and durable for years. ❤OCCATIONS - Comfortable hand touching, High Quality Zipper, 1 removable adjustable shoulder strap and 1 removable wrist strap, multi functions of shoulder bag, handbag, wristlet wallet, crossbody bag, clutch purse, bring you different experiences. ❤LARGE CAPACITY - Multi-pocket large-capacity design, 1 phone bit, 1 document bit + 1 Middle zip pocket + 1 hidden zip pocket + 1 rear zip pocket, can be easily carry your keys, credit cards, small cosmetics necessities, lipsticks, smart phones, etc. ❤WARRENTIES - 100% Satisfaction Guarantee, We provide 12 MONTHS warranty. If there's any reason causes you not completely satisfied with our product, please contact our customer service, we will give you a nice solution.